An apartment complex near the University of Anbar. A UN assessment in March and satellite photography indicate substantial damage inflicted on residential areas during months of fighting in Iraq. The top United Nations official in Iraq has expressed concern over the continuing acts of violence in the country, which last month took 1,119 lives and injured another 1,561 – according to casualty figures recorded by the UN Assistance Mission for Iraq (UNAMI). “I am extremely disturbed at the continuing loss of life and injury as a result of terrorism, violence and armed conflict. It is totally unacceptable that civilians should bear the brunt of violence,” said the Special Representative of the UN Secretary-General (SRSG) for Iraq, Mr. Ján Kubiš, in a press release. Among the casualties were civilians in personal security details, facilities protection police and the fire department, in addition to 45 federal police officers killed and 50 others injured. The Iraqi Security Forces, which included Peshmerga, Special Weapons And Tactics Team (SWAT) and militias fighting alongside the Iraqi Army but excluding Anbar Operations, experienced 544 killed and 365 injured. The overall casualty figures saw an increase from February, where a total of 670 were killed and 1,290 were injured. “My hope is that the proposed reforms will be implemented and will lead to an eventual normalcy in this beautiful country,” Mr. Kubiš asserted. With 259 killed and 770 injured, Baghdad totalled 1,029 civilian casualties, making it the worst-affected Governorate. Elsewhere, Ninewa endured 133 killed and 89 injured; Babil, 65 killed and 141 injured; Kirkuk, 34 killed and 57 injured; Diyala, 11 killed and 0 injured; and Salahadin, 6 killed and 1 injured. According to information obtained by UNAMI from the Health Directorate in Anbar, up to and including 30 March, that Governorate suffered 201 civilian casualties, comprised of 64 killed and 137 injured. The UN mission noted that it had been hindered in effectively verifying casualties in conflict areas as well as reports of large casualty and unknown numbers of persons who died from secondary effects of violence after fleeing their homes – due to elements exposure and lack of water, food, medicines and health care. For these reasons, the figures reported are considered as the absolute minimum. 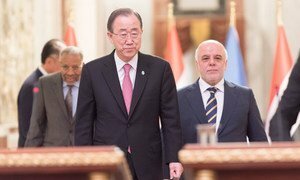 Visiting Iraq today for the eighth time as United Nations Secretary-General, Ban Ki-moon said he is impressed by the progress made, particularly against the Islamic State of Iraq and the Levant, or Da'esh, but warned that he remains extremely concerned about the enormous challenges the country faces.